They were all the world to him. Saying, “Charlie, my hour has come. I’ll wear it in the fight. She kissed and sent me on. And jeered them as they fell. Lay dead along with him there. In the histories of the Civil War, the Battle of Gettysburg almost always takes up the greatest space and gets the greatest attention of any fight. But you would never know it from the songs. There are many, many songs about Shiloh, the first great battle in the west. Bull Run has several also. Even such small things as the Battle of Mill Springs can rate a song. Not Gettysburg. Nor Antietam, nor Chancellorsville, or almost any of the great battles of the Army of the Potomac. For some reason, they seem to have gone almost unsung. That includes even such heroic events as the charge of the First Minnesota at Gettysburg. It was on the second day, and Robert E. Lee had sent two divisions of James Longstreet’s corps to attack the federal left wing. And the union commander in that sector, Daniel Sickles, had largely played into his hands, abandoning the key position of Little Round Top to take what he thought was a stronger position. Longstreet’s two divisions demolished Sickles’s Third Corps (it would be amalgamated with other corps before the 1864 campaigns). Longstreet was also soaking up all the strength of George Sykes’s Fifth Corps. And still his men were pushing forward. 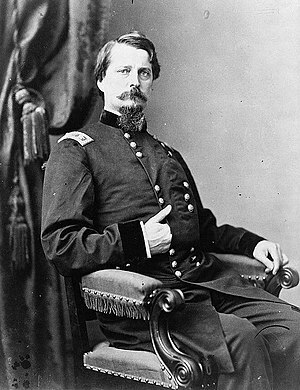 George Gordon Meade, the commander of the Union army, put Winfield Scott Hancock in charge of the left wing, including the Third Corps, the Fifth Corps, Hancock’s own Second Corps, and units from two other corps. But Hancock needed time to form a line. As he examined the ground, he saw seven companies of the First Minnesota coming closer. 262 men. He ordered them to charge the Confederate line — and, though the Confederates in all outnumbered them perhaps forty to one, the Minnesotans did it. Hancock thought it bought him five minutes, and that five minutes was just enough. The price was high. Of the 262 men in the charge, 47 came back unharmed. The other 215 — 82% — were killed or wounded. This is generally regarded as the highest single-action loss of any regiment in the entire war. [T]here was a flag dimly visible, coming toward us from the direction of the enemy. “Here, what are these men falling back for?” said [II Corps commander Winfield Scott] Hancock. The flag was no more than fifty yards away, but it was the head of a Rebel column, which at once opened fire with a volley. Lieut. Miller, Gen. Hancock’s Aide, fell, twice struck, but the General was unharmed, and he told the 1st Minn., which was near, to drive these people away. That splendid regiment, the less than three hundred that are left out of fifteen hundred that it has had, swings around upon the enemy, gives them a volley in their faces, and advances upon them with the bayonet. The Rebels fled in confusion, but Col. Colville, Lieut. Col. Adams and Major Downie are all badly, dangerously wounded, and many of the other officers and men will never fight again. More than two-thirds fell. This is as close as we come to a song about Gettysburg. It’s not really about any specific battle. It’s certainly not about the First Minnesota, which was an infantry unit, and the soldiers here are cavalrymen! But a few versions mention Gettysburg, though more mention the Battle of Fredericksburg, and a few relate to other battles in other wars, such as Bunker Hill or Custer at the Little Bighorn! But let us act as if it is about two soldiers of the First Minnesota; they certainly earned a song! The first book to contain this seems to be Virginia Frances Townsend’s 1864 book The Battlefields of Our Fathers, but she does not appear to have been the author. Jim Dixon alerts me to the fact that the very first printing seems to have been in a February, 1863 edition of Harper’s, meaning that it was probably composed immediately after the Battle of Fredericksburg. It is signed simply “L. C. M.” — which might even be a metrical indication rather than an attribution. There is no indication of who first set it to music; since the tune is related to Irish melodies, it probably gained its tune from the folk, not Tin Pan Alley. It’s interesting to note the mention of the older soldier carrying an image of his love. Nowadays, we see photos everywhere. It wasn’t so a century and a half before. Photography was several decades old by the time of the Civil War, but it was still a tricky process. It was only quite recently that photographers had started travelling from town to town, allowing people to acquire photos of their loved ones. The Civil War was the first conflict in which it was common (few people, of course, could afford painted portraits of loved ones!). Source: The text is from Dean, who calls it “The Charge at Fredricksburg” (sic). That is typical of the several obvious errors in his text, which I have corrected in brackets. Fredericksburg was fought on December 13, 1862, and was one of the worst Union defeats of the war, with the Union losing some 12,700 men and the Confederates 5,300. 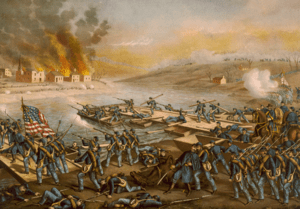 The song is accurate to the limited extent it describes the battle: The Union forces tried to attack an entrenched Confederate position atop Marye’s Heights. They failed utterly; there was simply no way at this time for troops to successfully storm a properly defended position, and General Burnside, who commanded the Army of the Potomac should have known it. Some of his junior officers did know it. The First Minnesota was present at Fredericksburg, but was fortunate not to suffer badly in the debacle; brigade commander Alfred Sully (who earlier had commanded the First Minnesota) refused to send his brigade out to be slaughtered with the rest of the Union army. Unfortunately, Sully was relieved over a problem with another regiment in the brigade in mid-1863; at Gettysburg, Brigadier General William Harrow led the brigade (which also contained the 19 Maine, 15 Massachusetts, and 82 New York), and Colonel William Colville the 1 Minnesota itself. Harrow seems to have been a much less effective officer than Sully (to be fair, he had only been given the brigade command a few weeks before), and his major contribution prior Gettysburg seems to have been placing Colville under arrest because troops — not Colville’s — had hissed at an officer (Imholte, pp. 114-115). The 1863 Harper’s text is given below.